Each person who remembers Robin Williams will see scenes from his career tonight and for many nights to come. So many moments stand out. So many choices. I carry a moment from Hook. In this film, Williams plays Peter Pan – Peter Pan who has grown up to become Peter Banning. Peter Pan who has forgotten his friends, forgotten how to play, forgotten Never-Land. He even has children now – although he is so immersed in the world of business that he no longer has time for his children or his wife. 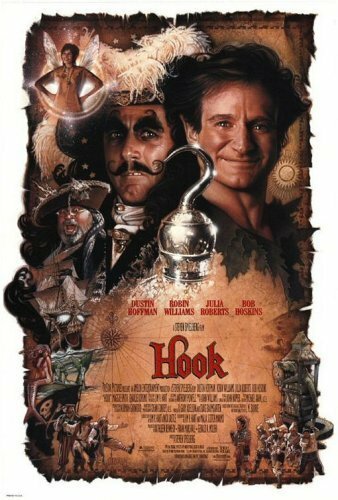 When Captain Hook kidnaps his children, Peter returns to Never-Land to rescue them. There he realizes that he cannot save his children on his own. Toobtain help, he turns to the Lost Boys. And they have no idea who this grown-up is – particularly since he can no longer fly or use his imagination or play or crow. “I am Pan,” he insists. Finally one of the Lost Boys looks him directly in the face. He reaches out and touches Pan’s face, staring intently, manipulating it, studying it. “Peter, are you in there?” he asks.For me, it is an image of God moment.All of us, each of us, bears the image of God.No matter how life has worn on us, torn at us. No matter how we have abused and misused ourselves. No matter how our culture has denied and despised us. We bear the image of God. When you see a mirror, look at your face. Look at the faces of those around you. Look at all the faces you meet. Look carefully, prayerfully, deeply. Look long. Look well. No matter how weathered and worn, battered and bruised, smudged and soiled . . . inside the faces . . . inside every face . . . inside your face . . . there God’s image resides. God give us grace to seek God’s image in one another and to treat one another as bearers of that image.